13.35" (340mm) long 4mm stainless steel shaft with brass stuffing tube. Includes threaded & tapered drive dog that will never come loose. And nylon locking propeller nut. This shaft is made for 4mm smooth bore props. -It can be used with 4mm threaded props by simply removing the drive dog. -In order to use this item with 3/16" propellers, combine this shaft system with the ose-1030 prop sleeve. 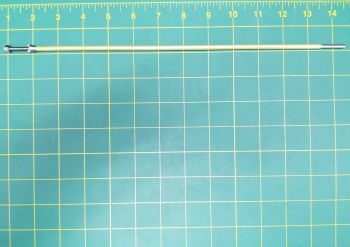 13.35" (340mm) long measured tip to tip.